This test is formulated for use with urine specimens. Fresh urine does not require any special handling or pretreatment. Urine samples should be collected such that testing may be performed as soon as possible after the specimen collection, preferably during the same day. The specimen may be refrigerated at 2-8oC for 2 days or frozen at -20oC for a longer period of time. Specimens that have been refrigerated must be equilibrated to room temperature prior to testing. Specimens previously frozen must be thawed, equilibrated to room temperature, and mixed thoroughly prior to testing. Note: Urine specimens, and all materials coming in contact with them, should be handled and disposed as if capable of transmitting infection. Avoid contact with skin by wearing gloves and proper laboratory attire. Review "Specimen Collections" instructions. Test device, patient's samples, and controls should be brought to room temperature (20-30oC) prior to testing. Do not open pouches until ready to perform the assay. Remove the test device from its protective pouch (use as soon as possible after opening). Place test device on a clean and level surface. Draw the urine sample into the pipette. Dispense 3 (full) drops (approx. 100ul) into each specimen well (2), then start the timer and wait for the colored lines to appear. Read result between 5 to 10 minutes after the addition of sample. Do not read after 10 minutes.Please note: the picture below shows a multi-panel cassette. The single panel cassette devices work in a similar way. The single test device has only one well to place the 3 drops of urine into and only one Result Window to interpret the results. Positive: One colored line appears in the control region (C). 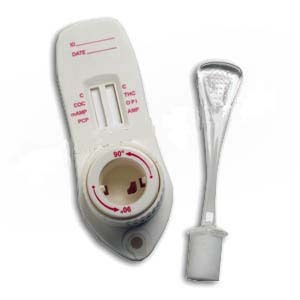 The absence of a test line adjacent to the drug name indicates that the drug concentration in the urine sample exceeds the designated cut-off for the specific drug. *This assay provides only a preliminary analytical test result. A more specific alternative chemical method must be used in order to obtain a confirmed analytical result. Gas chromatography/mass spectrometry (GC/MS) has been established as the preferred confirmatory method by the National Institute on Drug Abuse (NIDA). Clinical consideration and professional judgment should be applied to any drug of abuse test result, particularly when preliminary positive results are indicated. For more information, visit our Lab Confirmation page (click here). Negative: Each negative must have a line in the control (c) region and a line adjacent to the drug name. The color intensity of the test line may be weaker or stronger than that of the control line or adjacent test lines . A line as faint as a "GHOST" line is still a negative. Invalid: No line appears in the control region. Under no circumstances should a positive sample be identified until the control line forms in the viewing area. If the control line does not form, the test result is inconclusive and the assay should be repeated.